Made from recycled tires; product is designed to look like real wood mulch. Make all your gardening wishes come true with the EZBorder Scalloped edge garden border. Made from recycled rubber tires, EZBorders are ecofriendly, durable and long lasting! This decorative border come flexible enough to easily conform to almost any curve allowing greater customization in your green space. Ideal for flower beds, gardens, pathways, driveways borders and more! Black Rubber Mulch is rated 5.0 out of 5 by 4. 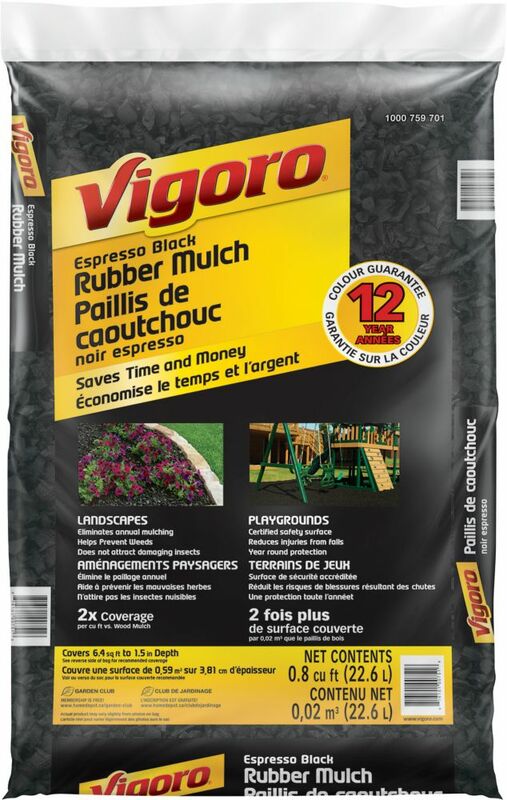 Rated 5 out of 5 by Patchhouse from Vigoro Black Rubber Mulch To be honest, we only got the final 20 bags (50 in total) down before the snow storm of Tues Oct 2/18 -but it looks beautiful - dark black and even with the incredible winds of Oct 13 - none flew around. Will report back in the spring once we see how the weeds are suppressed . Rated 5 out of 5 by Jelkap from Looks great!! I think this stuff is great!’ It’s easy to put down and it lasts. Rated 5 out of 5 by Jenthecurler from Very happy Decided to try rubber mulch for the front garden as we were tired of the black mulch fading a week after spreading it. Love that this stays black and doesn’t blow around as much. How many bags would I need to cover a 400 sq foot area? Would this be suitable to use in the (random and largish - several inches on average) spaces between flagstones in a path (with grass on the sides)? What depth do you recommend?